It would be almost impossible to imagine life without flowers. And, even if one could, how desolate and uninspired that life would be. How positively tan! From the first pop of a spring peony to the final sigh of a mid-fall dahlia, flowers are a balm for the eye and soul and a potent, ongoing reminder of nature’s ability to excite. Speckling the lush backbone of the Brazilian rainforest as well as the seemingly cruel Sahara; gracing the great rooms of suburban homes and hotel lobbies, urban offices and remote huts alike; adorning every corner of the natural and man-made worlds, flowers unite us. They inspire us. They inch us toward our better selves by themselves being so singularly provocative while remaining interdependent, smart community members. We each have our favorites that come to us when we imagine ideal moments-in-time – future weddings and births punctuated by the perfect combination of hues. Daydreaming, we muse…what flower says I love you; what color means joy to me; will I have russet or ivory tea roses at my daughter’s bat mitzvah? And what do these flowers ultimately say about me? Or my firm? Or my family? Because each flower has a unique personality and a distinct image it projects. Lilacs seem to whisper. Gerber Daisies like to giggle. Tulips can be regal OR goofy depending on the setting and the occasion. So, you need to ask yourself as you consider your floral choices. Are you a single stoic calla lily or a hearty mum with a good sense of group? Or are you an upbeat sunflower with your face to the sun? Much lauded and painted, studied and admired – sunflowers are a perfect addition to any arrangement for their particular ability to project unadulterated joy and harmony. Yet, in spite of their sweet demeanor, there is something inherently formidable about sunflowers like a friend you might call at 2:00am for advice or that seemingly efficient car that sings. Someone you can count on, a solid open-faced citizen. Stalwart. Lasting. Worshipped by the Incas, the noble sunflower boasts a cheery face, ringed by a lion’s mustard mane, and a meaty green stalk, itself worthy of note for its ability to reach unimagined heights (120 inches or more) almost before our eyes. Capable of shouldering plate-sized blooms that track the light, made famous by Vincent Van Gogh, and immortalized by myriad other artists in addition to master and novice gardeners, the sunflower is a giant among flowers. The wild sunflower is native to North America; but it wasn’t until its commercialization in Russia that it grew in popularity. Only recently, as far as human history goes, returning to North America to become the cultivated crop we know today, it was the Native Americans who first domesticated the plant as early as 3000 BC. Beautiful, interesting, AND their seeds are good for us. And good for the earth. From calling winter birds to our sills to energizing us mid-run, sunflower seeds are an excellent source of antioxidants and a burst of nutrients. And they’re tasty! Crunchy. Earthy. Kind of quirky on the tongue, sunflower seeds now come packaged and pre-flavored in an assortment of interesting flavors. From the armies peppering the fields of Tuscany to the slopes of Peru, these happy flowers with their earnest chocolate faces bring smiles! Please ask about how we can weave sunflowers into your ideal bouquet or centerpiece. 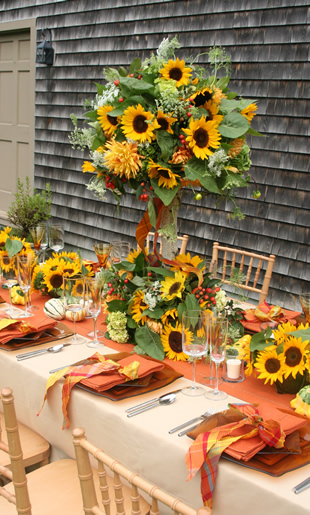 In the meantime, take a moment to check out these arrangements that bring out the best in these well-loved flowers and let us know how we can make your perfect sunflower statement.